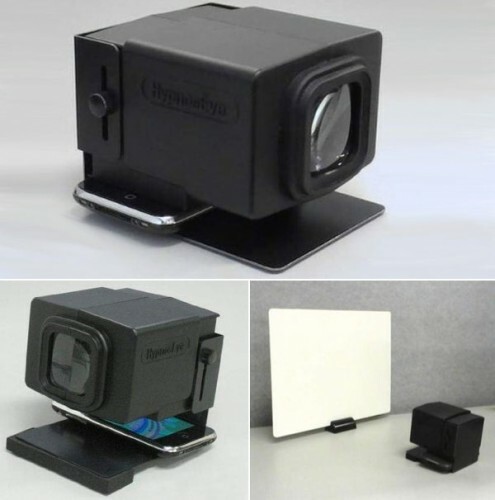 HypnosEye, The Poor Man's iPhone Projector | OhGizmo! While we’ve seen our fair share of projectors for the iPhone, all of them work by taking the device’s video feed, amplifying it and projecting it onto a surface. Not so for the HypnosEye. It simply uses a lens and a mirror to project images from your iPhone’s (or iPod touch, we suppose) screen directly to a projection screen. No amplification. rather than use an ordinary mirror which would result in an unclear image, HypnosEye has implemented a special mirror with a reflection agent on top of the glass surface (rather than behind). As a result, you can show media from your portable device almost anywhere at anytime. For the full specs, price and a video, keep reading. Weight: 80g (screen), 400g (projector and stand). It’s all of $80 plus $30 for worldwide shipping. Neat, but $80? I don't see why you wouldn't just transfer the pictures to your computer. I mean I don't think someone would carry this around with them to just show people pictures. haha I miss read… Instead of taking the data through a feed to display else were they are just mirroring the “images from your iPhone’s” as in what it is displaying. Wow, really? A first surface mirror? That sounds so exotic! You're thinking they're thinking? I'm thinking they're thinking. What do you think?